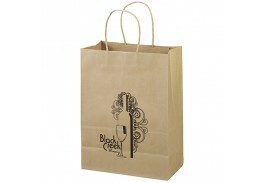 Custom plastic and paper bags are an easy and economical wayto promote your business or event. 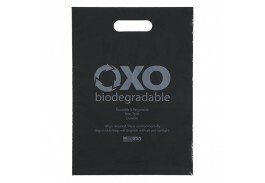 Reusable and recyclable, they are atradeshow necessity! 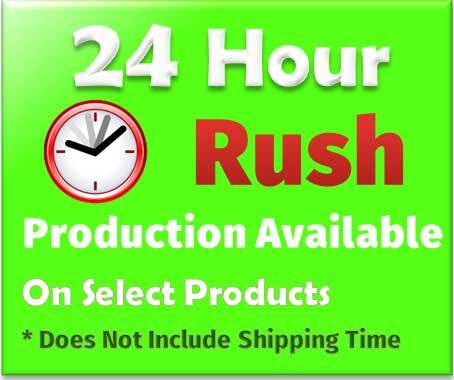 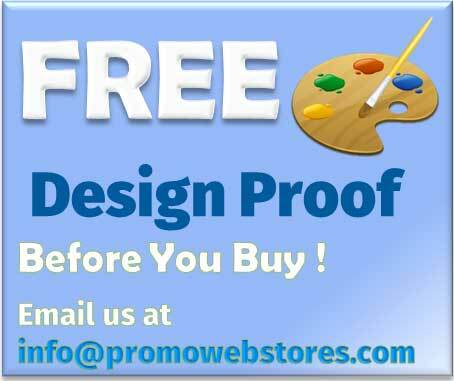 Imagine the number of people running around at a tradeshow,scooping up the free promotional gifts on each table. 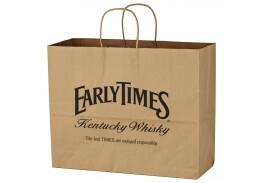 Now imagine these folkscarrying all of it around in a personalized plastic or paper bag featuring yourcompany logo. 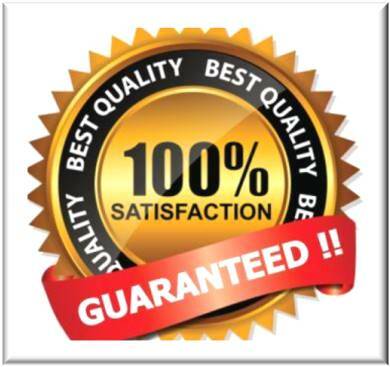 Your name will be everywhere, and seen by everyone, garnering yourbrand a lot of attention! 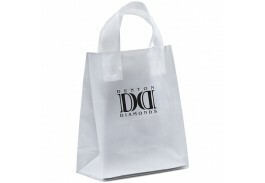 While everyone else is passing out some toss away gimmick,they will be taking it all home in your custom imprinted plastic or paper bag. 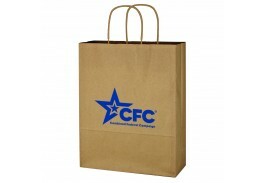 Economical, recyclable, and reusable,custom plastic and paper bags come in a variety of styles, shapes, sizes, colors,and imprints.We offer standard flexography and foil hot stampimprints, as well as full color and digital full-colorimprinting to make your logo stand out for a unique product that clearlyadvertises your business. 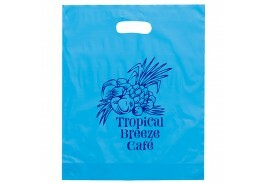 Imprint options vary depending on the type of bag you choose. 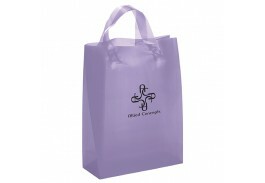 Our promotional plasticbags make great goodie bags for events and tradeshows. 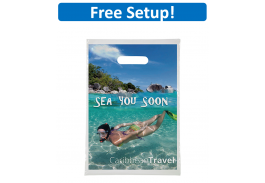 You can fill them up withcompany information like brochures, coupons, and other personalized items.Perfect for any dentist office, you can put a custom lip balm, toothbrush,toothpaste and dental floss in a personalized plastic bag (all of which wesell! 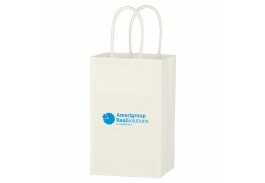 ), and send home patients with everything they need to keep their smilesand teeth happy and healthy! 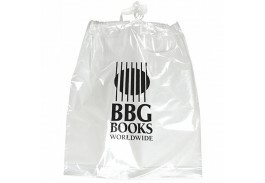 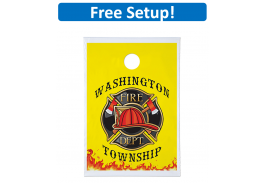 We have custom plastic bags with standard die cuthandles, regular loop handles, and even one with a poly- draw tape closure. 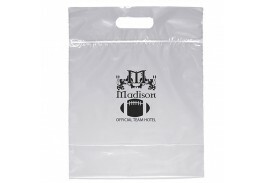 Wealso offer a couple of bags that meet NFL stadium security requirementsand would make a great sports gift bag. 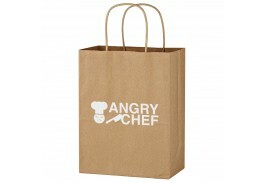 Our custom paper bags are idealfor customer gifts. 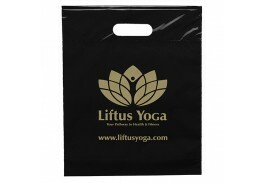 Whether you are looking for a basic brown kraft or whitebag, or something more glamorous like a colored bag with a foil hot stampimprint, we have just what you are looking for! 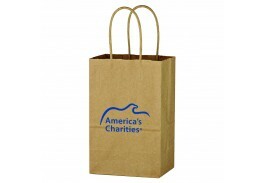 100%Recyclable, our promotional paper gift bags come in a variety of shapes, sizes,and colors with full size handles and offerplenty of room for gifts, or for use as shopping or restaurant take out.